Craftastical! 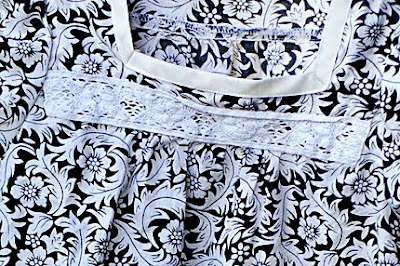 : Etsy Shop Update--New goodies and more to come! Etsy Shop Update--New goodies and more to come! What a bad blogger I've been lately! Honestly, we have so much going on. I'm trying to get into a routine with school before starting my school this next week, I've been dealing with depression on and off, I've been working with my sister on new Etsy stuff, we are thinking about buying a home soon and we've been talking about that, looking at houses and trying to work all that out. Crazy, I tell you! I've enlisted my sister to help with my (I guess OUR) Etsy shop. She took the pictures and put up the listings, so a big thank you to her! We want to go on a family cruise in March of next year, so we are trying to finance that. 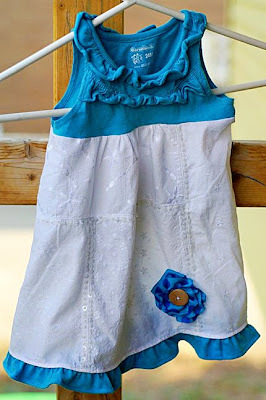 We've also been sewing like crazy this week and just wait until you see the cuteness coming your way soon. To borrow a phrase from Rachel Zoe, "I die." 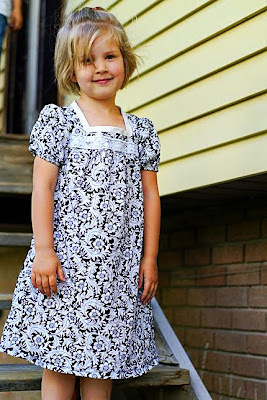 In the meantime, a slew of little girl dresses, all from patterns I came up with myself. 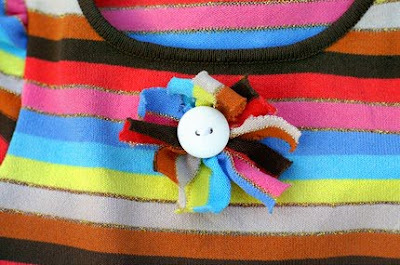 Close-up of the button flower. 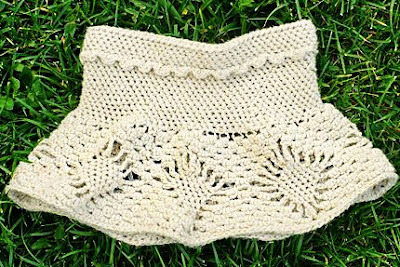 Next is this size 12 months crocheted skirt. This pattern is one I came up with myself, using a pineapple motif. It's got elastic around the top. I need to make one for Aubrey. 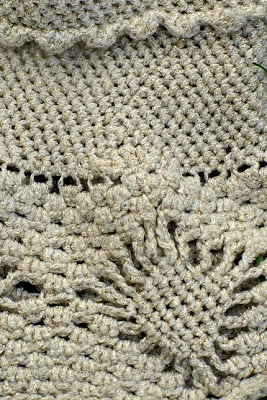 This yarn is so cute in person--tan with little gold threads running through it. I'm not sure how many hours this took me to crochet, but totally worth the time, because I'm in love. My mom wants a full-sized one. 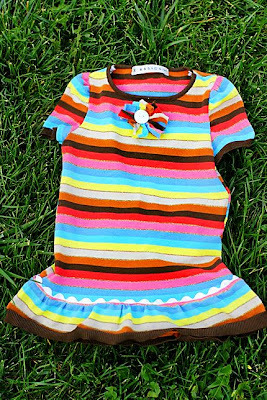 This 24 month size dress is possibly one of my favorite upcycled dresses ever. It's white and teal. The white shirt used to be a woman's shirt. I adore all the sequins and embroidery and is stunning in person. 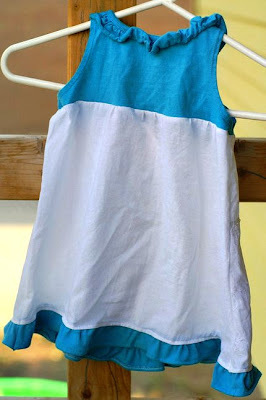 The top is a regular old tank top. I used the rest to do the ruffle at the bottom. 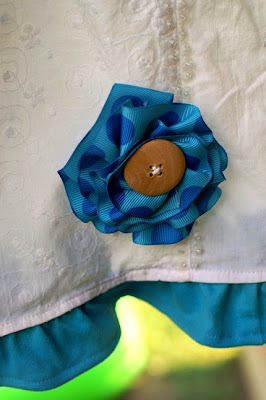 The flower is a ribbon rose I sewed with a wood button. It does hang straight, but it looks wonky on the hanger. I tried it on Aubrey and if it wasn't just a touch too small for her, I'd be keeping it. I think it would be adorable for winter with a long-sleeved shirt and (cough, cough) leggings. The back. Close up of the ribbon rose. 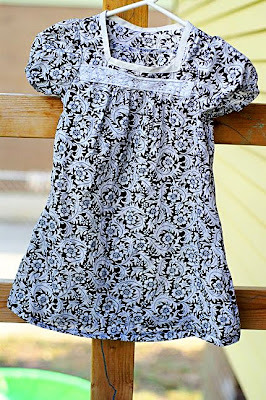 This 4T dress was my first try at upcycling and I still love it. Made from a woman's long-sleeved blouse, it's just too cute on my niece, Maddy. Hope you enjoy looking! Let me know if you have any questions or have any special requests.